Ray “Skip” Sandman formally filed to run for Congress with the Minnesota Secretary of State on Tuesday. Mr. Sandman, the endorsed candidate of the Independence Party of MN, had this to say after. 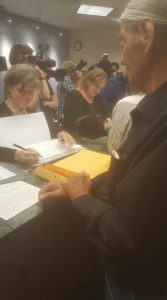 “We have filed our Affidavit of Candidacy with the Secretary of State and presented the clerk with roughly 1400 petition signatures nominating me to be on the November 6 ballot for the 8th CD seat. Minor Party and Independent Congressional Candidates are required to produce 1000 signatures of district residents that are eligible to vote. I am humbled by those wishing to see me on the ballot and grateful to the 40 volunteers who promoted the petition. The volunteers’ exuberance in gathering signatures produced a 40 percent surplus and we are confident that The Secretary of State will be validating our candidacy by early next week. The voters of this district deserve another choice on the ballot besides proponents of ‘politics as usual ‘and feeble ‘free-market’ solutions to our failing economy. 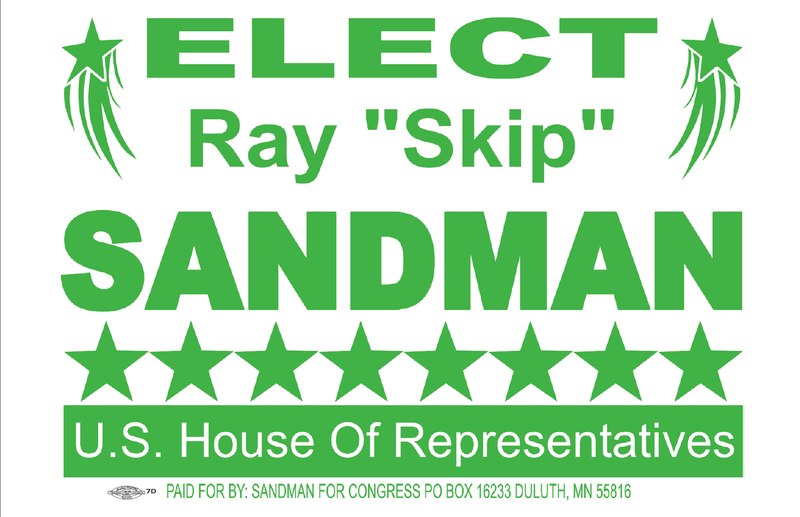 Our campaign is determined to show in the coming months that Skip Sandman is worthy of their vote. 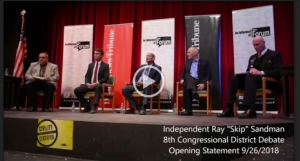 8th Congressional District Candidate Ray “Skip” Sandman appoints Campaign Manager. Today, Skip Sandman promoted one of his current campaign team, Terri Mathews, to take the position of Campaign Manager. “Up to this point our campaign has run effectively enough, but it has become clear that some roles needed to be better defined as we follow the path to victory in November. Terri shares my values, has shown amazing leadership skills and is a great organizer. She has my utmost confidence and the respect of the entire team.” Sandman said. 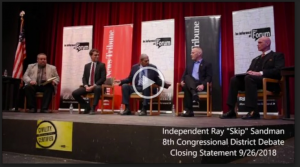 DULUTH — The political pairing of Ray “Skip” Sandman and the state Independence Party came together over coffee at a roadside restaurant in Hinckley. What started as an introductory get-together yielded a match which will carry into the 8th Congressional District race. 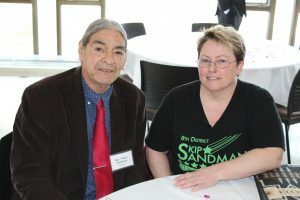 Sandman, 64, is making his second bid for the office after running as a Green Party candidate during the 2014 8th District race. My condolences go out to the families and friends who suffered this senseless and needless tragedy that occurred at yet another one of our country’s schools, this time in Parkland Florida, is one more mass shooting that could have and should have been avoided by common sense legislation enacted by our elected representatives. As a country we have kicked this can down the road long enough. When do we say as a nation enough is enough? It is long past time that congress does the job of the American people and not the bidding of the NRA. I call on congress to act now and enact legislation to end the gun violence which is a uniquely American problem. “My name is Skip Sandman, I live right here in Duluth, downstream of Polymet. Maintaining our clean water is a necessity for our physical health, and our economic health. It is our responsibility to fight for our children and their right to clean water, to fish from and enjoy this beautiful Lake Superior that is in our own back yard. The Polymet mine is the largest new threat to our region’s supply of fresh water. To mine copper-sulfide ore, the metals need to be separated by finely crushing sulfide bearing rock. When exposed, the sulfides create acid which leaches several heavy metals, such as mercury and lead from the remaining waste rock. These heavy metals then need to be contained to prevent them from getting into our air and water. When the containment fails, and it will… because they all have leaks, besides heavy metals, sulfates are released and converted into methyl mercury in rivers and enter our bodies when we eat fish from contaminated rivers. One in ten newborns in the Lake Superior Basin ALREADY have unsafe levels of mercury in their blood, we simply cannot risk adding more mercury into our environment. Polymet plans to place a 250 ft tall earthen dam on top of the existing LTV tailings pond to contain the toxins it produces. They believe that this containment will last for hundreds of years. Over those hundreds of years, it would be nearly impossible to prevent catastrophic failure of the containment and the pollution would work its way down the St. Louis River. Additionally, any environmental safeguards will be expensive to maintain and will be abandoned eventually by Polymet after they close their mine. It should be crystal clear to all of us, that we will be left to deal with the mess. We cannot trust these companies to simply do the right thing on their own. Plus, the current political power in Washington DC and in St Paul is bent on eliminating environmental regulations and handcuffing our enforcement agents. Therefore nobody will be left to force them to keep our water clean either. 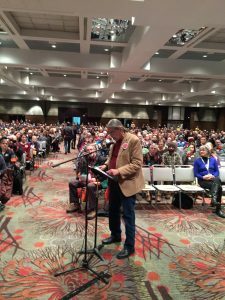 Our best approach would be to never let Polymet begin mining.